The Archdiocese of Cincinnati was founded in 1821. Headquartered in the 106-year-old Faller Building in Downtown Cincinnati, the Archdiocese oversees a vibrant community of more than half a million parishioners throughout a 19-county region in Southwest Ohio, including the Greater Cincinnati and Dayton areas and beyond. As there is more space in the building than what is needed for Archdiocesan staff, the building recently underwent a renovation project meant to make the building a more attractive home for tenants. Among the areas that underwent remodel were the entry lobby and ground floor elevator lobby, conference room and other shared spaces – giving the spaces a more inviting atmosphere for the Archdiocese, tenants and visitors alike. 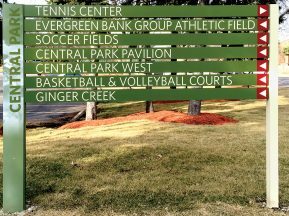 ASI was asked to participate in providing necessary signage replacements after the renovation, including the replacement of the entrance directory. Wanting to embrace technical advancements the Archdiocese decided to replace their existing static directory signage with a new digital directory. Additionally, the Archdiocese tasked ASI with developing an aesthetically pleasing sign solution that honored the 106-year-old building. 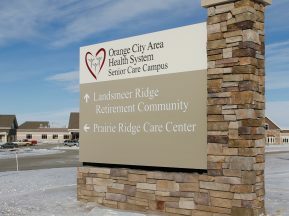 Being a non-profit organization they were at all times mindful of keeping the solution as cost-effective as possible. Phase one of the project was a complete renovation of the Archdiocese offices. 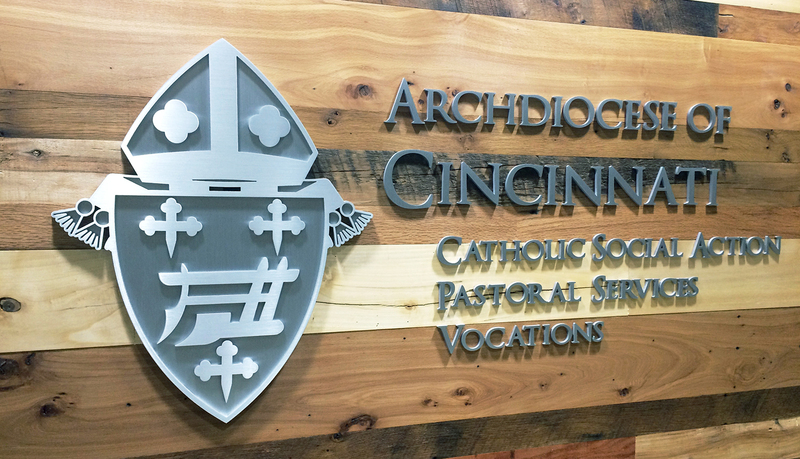 To identify the office area ASI recommended cut aluminum letters and the Archdiocese logo shield. The shield is made up of two layers of brushed aluminum, with the grain running vertically on the top layer and horizontally on the bottom layer. This was then placed on a reclaimed wood wall, making for a stunning look as visitors exit the elevator bank. 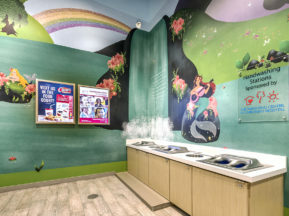 The second phase was the renovation of the main entrance lobby. Initially, the replacement directory for the lobby was meant to be a traditional directory, made of wood laminate panels and glass with stand-offs. However, as the Archdiocese owns the Faller Building and leases out the space to other tenants, it was determined that an interactive digital directory would be the most visually appealing and cost-effective long-term solution. After the demolition of the lobby, it was discovered that the wall behind the directory was constructed of cinderblock. 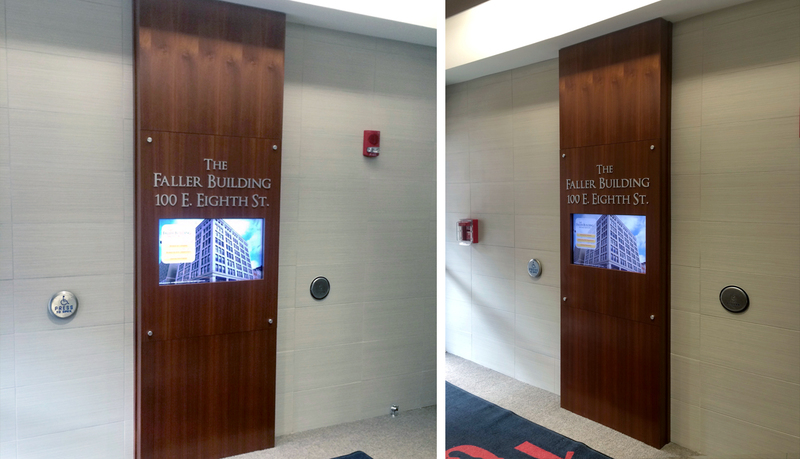 This added a new component to the design of the digital directory, which now needed to conceal the cabling and match the design of the renovated elevator lobby. ASI designed and produced the perfect solution, a floor-to-ceiling wood laminate cabinet constructed around the screen. Additionally, ASI provided a turn-key digital directory software solution specifically tailored to meet the needs of the Archdiocese, which included the design and branding of the home screen, images, and tenant information. 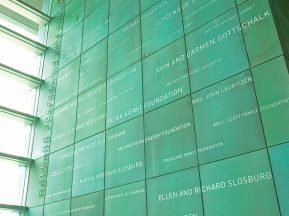 To honor the history of the building and the architect who originally designed it, ASI designed and fabricated an etched bronze plaque. Reproducing the historical halftone image on the plaque was somewhat challenging, but the owner was extremely happy with the ultimate results. The Faller Building at 100 E. Eighth Street now stands as a symbol of the confluence of past and present, much like the Archdiocese itself. 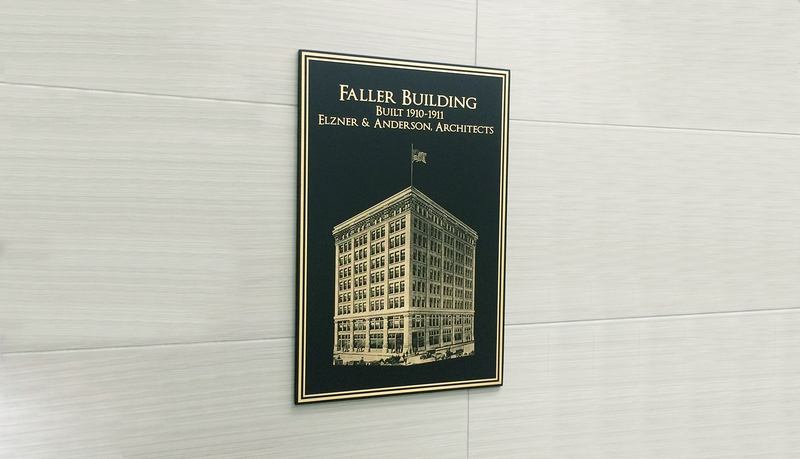 Added modern amenities, including the digital directory, help to ensure the longevity of the building as a cornerstone of downtown Cincinnati life.